Teachers, before beginning this lesson plan that introduces small solar system bodies, be sure that your students understand the concept of the solar system as well as the concept of planets, dwarf planets and moons.Then explain the following information to your students. A small solar system body is classified by the International Astronomical Union as anything in the solar system that is not a planet, dwarf planet or moon. 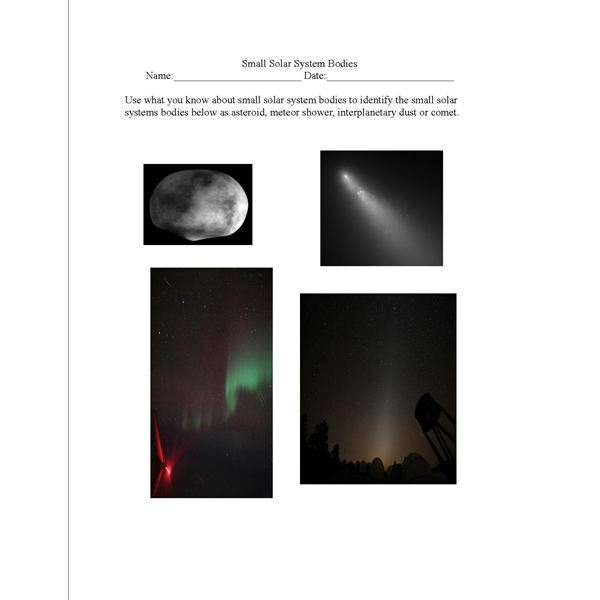 Use the activity below followed by the Small Solar System Bodies Worksheet to introduce some of the small solar system bodies to your students. Teachers, to complete this activity, please list the following information on a board or poster so that is visible to students as they complete this portion of the solar system lesson plan. The following criteria must be met for planets, dwarf planets and moons to be classified as such. Must be massive enough to have its own gravity which will pull it into an almost round shape. Dominant enough that it is able to clear its "neighborhood of debris". Any natural object that orbits a planet. After listing these criteria in a highly visible area, move on to the next portion of the science lesson plan. Teachers, please list on the board or verbally discuss the following list of objects. In doing so, please be sure to give students accurate descriptions of the following objects, but specifically of comets, asteroids, meteors and planetary dust.While discussing the objects, ask students to decide if the object is a planet, dwarf planet, moon or small solar system body. Once this small solar system body activity is complete, please print and disburse the small solar system body worksheet that will ask students to identify various small solar system bodies. This worksheet was created to lend focus to students' understanding of small solar system bodies, specifically comets, asteroids, meteors and interplanetary dust, all of which will be discussed further in the other solar system lesson plans included in this series.